The Safest and Strongest security grille. Through continuously innovation Stackdoor is the highest certified security grille recognized by insurers for facade and entrance. With the latest RC resistance class certificate (RC2/RC3) Stackdoor surpasses all other open security grilles. Hence Stackdoor security grille is applicable in circumstances where security level 4 and 5 is required. 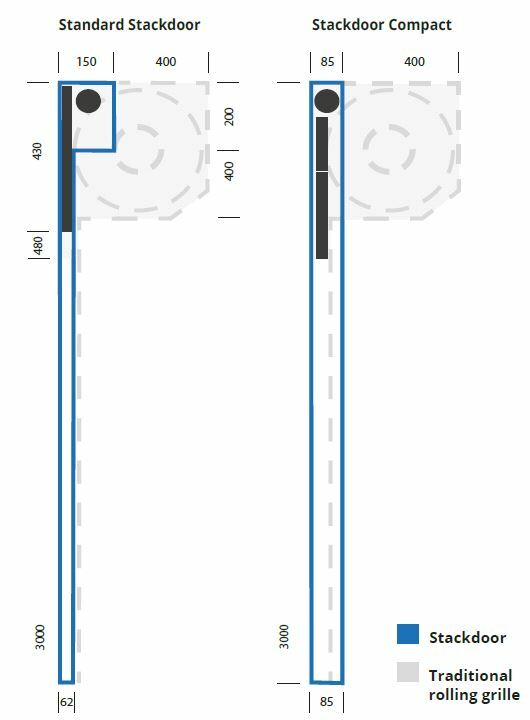 By showing the dimensions of a traditional rolling grille and Stackdoor with an average height of 3000mm, side by side, the reduction of size is apparent. 12 months Stackdoor warranty, extended to three years with Remax service offer.